Teddy Bear’s Picnic is a very cute video slot game from NextGen Gaming that brings back so many memories. All those images of bears take us back to our childhood when we were entertained by reading stories, especially before we went to bed. Well, this time the bears have a different story to tell, and if you listen carefully they might even reward you. There are a plenty of things that are worth mentioning when it comes to the special features department of the game. first we have the wild which stands in for every other symbol to complete a winning line, and the only symbol it cannot substitute is the scatter which is the key to the main feature, the free spins round. There is also a minor feature where the little teddy bear appears and turns some symbols into wilds. The free spins round is activated every time you land 3 or more picnic basket symbols anywhere on the reels. You will receive 8 free spins and during the feature when the wild appears it will remain in place while the feature lasts. The only downfall is that you cannot activate any more free spins from within the feature. 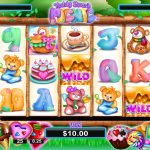 Teddy Bear’s Picnic is a really engaging slot that we gladly play whenever we have the opportunity. NextGen Gaming did a great job when they created this game. We like everything we see here, starting from the design of the game which is very detailed and stunning. 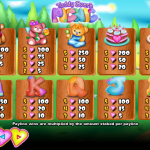 The game play is straightforward and there are a plenty of special symbols and features that will make the game play more interesting. We advise you to give this game a chance and we are sure you will love it just like we do. For another great engaging game you should consider playing Super Safari a 5 reel slot by NextGen.